Over the last few months I have stumbled upon several articles relating to a possible Grand Canyon UFO crash site. We decided to gather what little we could find on the subject and cover the case in the article below. Several months ago a specialized team of experts were apparently hired to examine debris found at the Grand Canyon. When they arrived at the scene they were said to have discovered the body of a UFO that had rested there for over 4,000 years. 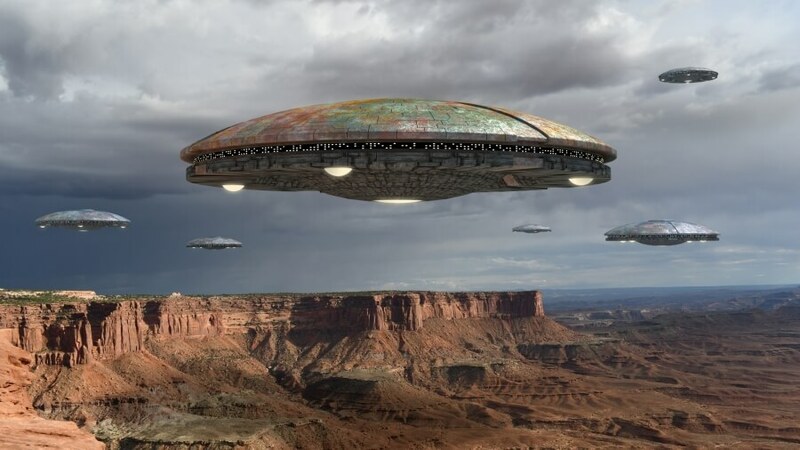 The team of experts were thought to be the core of a secret joint military task force on UFOs. The craft they located was constructed out of an unknown metallic substance and also showed signs of low levels of radiation. Once found it was quickly removed to a secure military location. A California based astronomer named Dr. Henry Leaumont claims to have inside information on the Grand Canyon UFO crash site. He believes that the craft was of a decent size and able to carry about twenty individuals of a certain height. He also believes that the carbon dating on the ship indicates that it crashed around the 2,000 B.C. period. When experts finally managed to get inside the craft they discovered that the cabin area was designed for humanoids of about 4-5 foot in height. There were machines that resembled oxygen tanks and there were signs of old supplies ( food and water ). The vessel was atom powered and had a steering system that was based on magnetic steering. The UFO was apparently located in an area known as Comanche Point – it was lodged deep inside a limestone formation. When the experts carried out a thorough search of the area they determined that the inhabitants of the vessel lived near it for years after the crash. Nearby Indian caves show paintings of strange humanoid creatures with bulbous heads. These illustrations are thought to depict the creatures from inside the craft. The experts believe that the all the alien life disappeared from the surrounding area about 50 years after the initial crash landing. They have no idea what might of happened to the beings that had lived around the fallen vessel. Dr. Henry Leaumont goes on to explain that the craft measured approximately 50 feet wide with a length of at least 100 feet. Dr. Henry Leaumont goes on to explain that the craft measured approximately 50 feet widewith a length of at least 100 feet. He also claims that the American government are doing all they can to keep this amazing find from the public. What are your thoughts on Dr. Henry Leaumont’s claims? Please leave your opinions in the comment section below.